People everywhere want to live close to modern conveniences, but keep the country feeling around their home. The yearning for the peace and quiet that country living provides is deep inside almost everyone. If that sounds like you then this might be the very list you need. Are you wanting to add a little rustic flair to your garden but you aren’t sure where to start? Here are 10 rustic planter ideas to help bring the farm to your yard. Whether it is a flower in a teapot or ornamental grass in a fancy dish, dishware is a great option for potting plants. A quick trip to your nearest second-hand store can get you all of the planters that you’ll need for your little garden. Make sure your wheelbarrow is well grounded so it doesn’t tip over and spill all of your plants. A great way to make it stable is to bury its legs partially in the ground. Then fill the belly with dirt and fertilizer and you’ll have a lovely little garden bed for your plants. If you can find yourself one of those little red wagons then you’ll have a wonderful garden spot. They are pretty stable so you most likely won’t have to make it completely stationary. Leaving it to still be rolled around the yard gives you a movable garden for when you’re feeling like changing things up in the yard. You can grow an entire little garden in a wooden pallet. Each slat between the wood can be a different plant giving each plant plenty of room to grow. If you don’t have a pallet you could order one from a wooden pallet manufacturer or see if one of your friends has one laying around that they don’t need. A little old dollhouse is an adorable home for a few plants. Just find a house that opens down the middle and then give it a new paint job so it doesn’t look like Barbie’s dream house. Each lucky plant can have its own little room. Old tin milk cans occasionally are found at second-hand stores or antique stores. They make a great pot for any plant that might need a little extra room to stretch its roots. A wooden barrel could be a great home to a bunch of little plants or even something more sturdy like a bush or small tree. If you’re needing more variety of depth in your garden you could even stick a trellis in your barrel and plant a climbing vine. If you have an old birdcage sitting around that you aren’t sure what to do with, try filling it with a little flowering plant. You can either hang the cage or set it somewhere sturdy. This will keep your plants safe from most animals and give a lovely way to display your plants. A tin washtub is a wonderful place for a little garden because it is deep enough for a healthy amount of soil but nice and close to the ground providing a sturdy and safe place for your plants to grown. 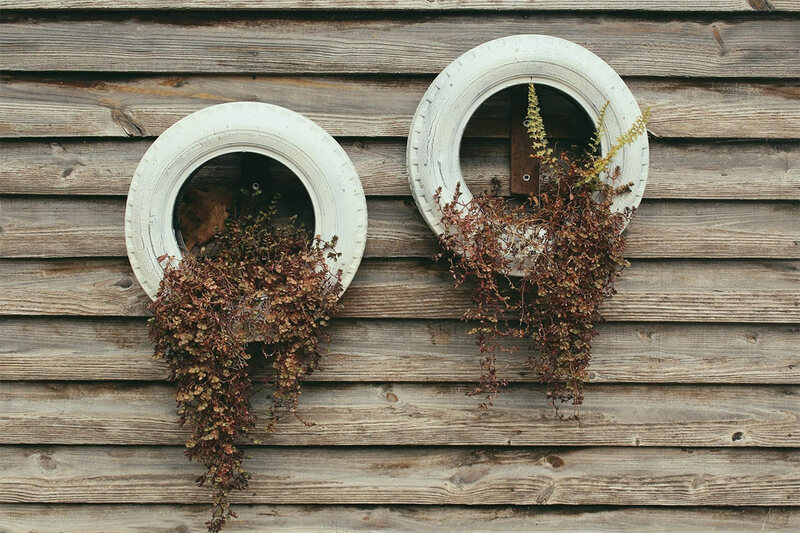 If you’re lucky enough to find an old tin train, tractor, or truck, you have found the perfect rustic planter. Choose a small delicate plant for this planter so you can still enjoy the rustic charm of your little planter and it doesn’t get completely eaten by foliage. Other simple rustic additions to the yard could be a bale of hay, old bicycle, or even old farm implement. The important thing to keep in mind is there is a fine line between rustic and too busy. If your yard looks super busy with old things it will start to look more like a trash pile. Always make sure to keep all of your plants well trimmed to help avoid the busy feeling. Another thing to keep in mind, if you repaint anything, make sure the paint you use is weather resistant. It would be a shame to go through all that hard work only to have your project fall apart soon after completion. Good luck gardening and remember to have fun!